January is over and that diet Puja and I were on is finally over. It was a tough 30 days, but we are pretty happy with our results. I lost nearly 15 pounds last month. I’m not going to say we ate perfectly every day, but we did stick to it pretty close to 100%, eating almost entirely a fruit and vegetable diet, eggs, zero bread and healthy oils, no processed foods. So of course we pigged out on Super Bowl Sunday! We had spicy chicken wings with blue cheese dressing, beer, nearly a whole bag of Ruffles Sour Cream & Cheddar potato chips, chocolate chip cookies, and did I mention beer? Then when our bellies were beyond full and bloated, we went out for dessert. We tried to go to a dessert restaurant that Puja has been wanting to go to for a while. But when we got there we found out they had gone out of business! But we found a dessert cafe a few blocks down. Puja was in the mood for something simple, a Raspberry Cheesecake. I got a New Orleans Croissant Bread Pudding. It came with a caramel sauce and two scoops of vanilla bean ice cream. All this to say, when we broke our diet, we really broke it. One of Puja’s creations that really helped us get through the month of January was this Pear Dessert. 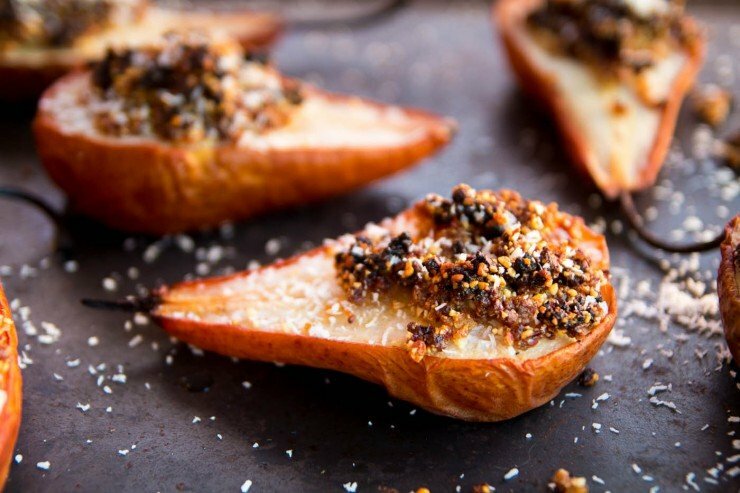 Between the sweet roasted pears and the nutty topping, eating these were almost like eating pie, but without the added sugar! 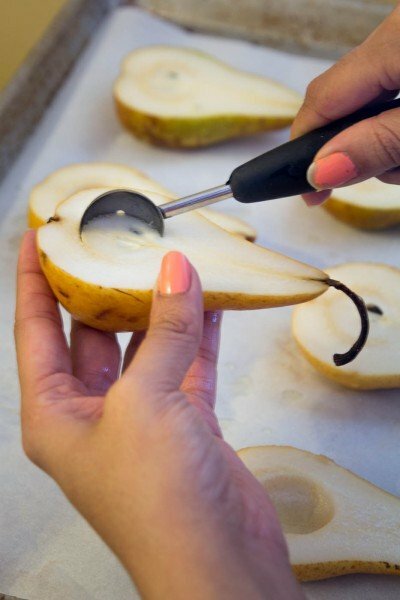 Cut the pears into half and scoop out the core using a melon baller or a teaspoon measure. It is also a good idea to cut a thin slice off the rounded side of the pear so that it sits evenly on the pan when the filling is added. 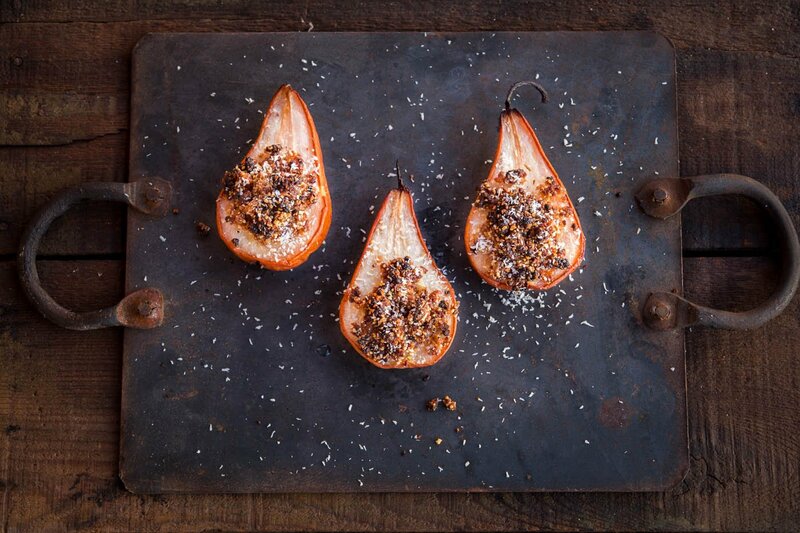 Brush the cut sides of the pears with coconut oil (about 1/2 tsp per half). 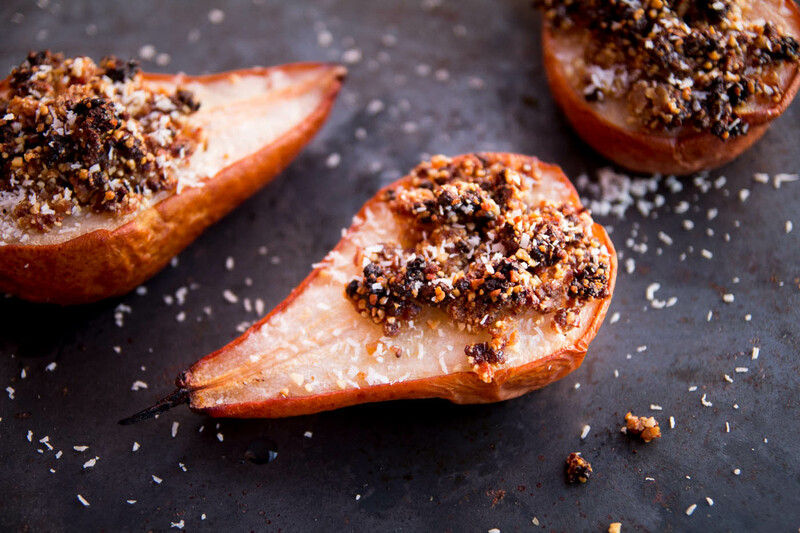 Set the pears cut side down on the lined baking sheet and bake for 30 minutes. While the pears are baking, toss the almonds into a food processor and pulse until ground to the texture of coarse cornmeal. Add the raisins, cardamom, ginger, salt and 1 tbsp of coconut oil and pulse until well mixed. 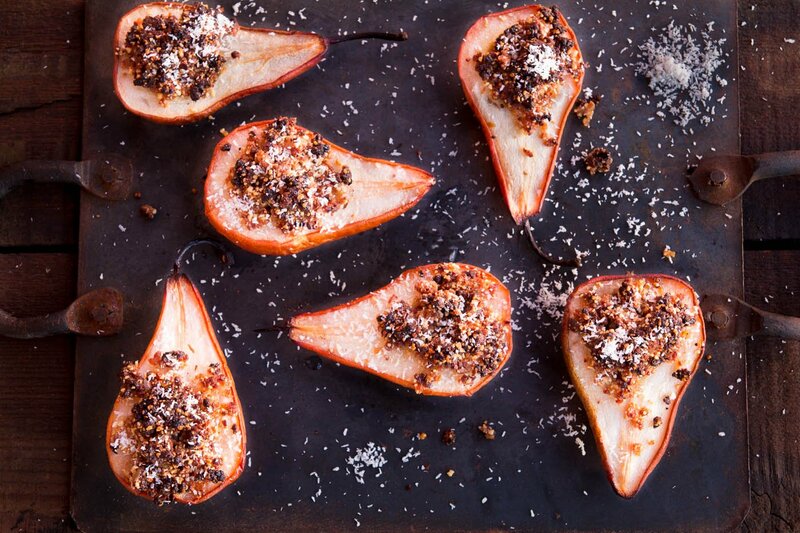 When the pears have baked for 30 minutes, remove them from the oven and flip each one over on the baking sheet. Evenly divide the almond and raisin mixture into the pear cavities. Return to the oven and bake for 15 to 20 more minutes, until the filling is golden brown. 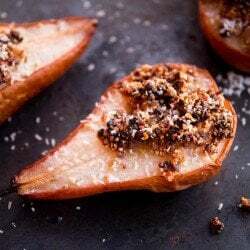 I made these pears about 5 or 6 times in one month and on about the 4th try figured out that if I baked the pears cut side down, they get a delicious caramelized golden brown color on the cut side. Unfortunately, we photographed them after our third attempt when I had still been baking them cut side up. This means that they don’t have the beautiful caramelized color of the later batches. Either way, the recipe tastes great. If you want a sweeter filling without adding any additional sugar, add two pitted and chopped dates to the filling. If you want to add sugar, two tablespoons of brown sugar would also taste great added to the filling. Comments on "Baked Pears: A Healthy Dessert"
I will bookmark your blog andd test once more here frequently. Keep up the very good works guts I've you guys to my blogroll. sometimes easy to configure and in addition put together. I think that everything published made a loot of sense. but what iif you addsd a title that grabbed folk's attention? I mean Baked Pears: A Healthy Dessert - Indiaphile is kinda vanilla. links.Yoou might add a video or a pic oor two to grab people interested about everything've ggot to say.